In 1834 the fur trade was in full swing when, at Independence, Missouri, 20 year old Osborne Russell joined Nathaniel Wyeth’s expedition bound for the Rocky Mountains and the mouth of the Columbia River. Later, Russell joined a brigade led by Jim Bridger. Russell spent the next nine years trapping and trading throughout the Rocky Mountains. Fortunately for us, Russell was literate and maintained a detailed journal of his experiences and observations. Even amid the dangers and often brutal circumstances the wilderness delivered, he was smitten by its beauty and penned this eloquent passage: “I almost wished I could spend the remainder of my days in a place like this where happiness and contentment seemed to reign in wild romantic splendor surrounded by majestic battlements which seemed to support the heavens and shut out all hostile intruders”. Russell wrote these words when he was in what later became Yellowstone National Park. 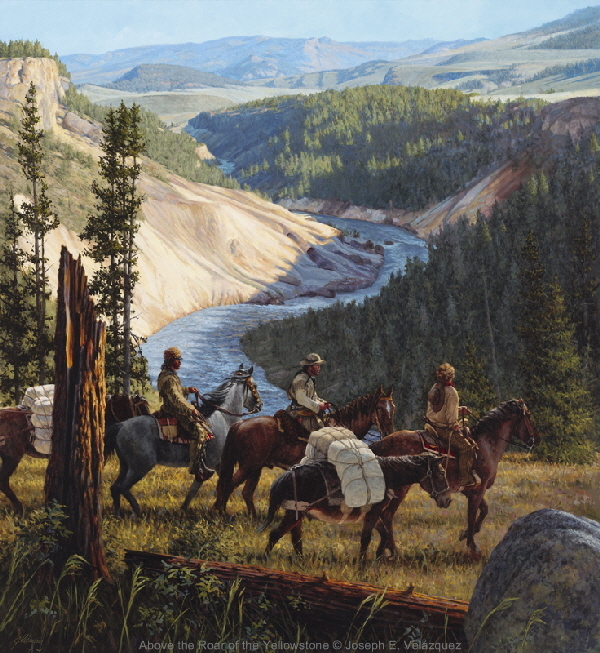 Inspired by Russell’s words, this painting depicts a trapper’s expedition skirting the canyon of the Yellowstone River. For early explorers and the mountain men, the Yellowstone/Jackson area became a crossroad of trails that led in virtually all directions.